Buckingham Shopmobility Service is a free scheme that allows anyone with a mobility problem, whether temporary or permanent, not just Blue Badge Holders, to get out and about in Buckingham town centre. There are allocated free parking spaces for Shopmobility users, next to the Shopmobility building. We have electric mobility scooters and manual wheelchairs. The service is sponsored by Buckingham Town Council and is free for anyone who wishes to shop or sight-see in Buckingham town centre. 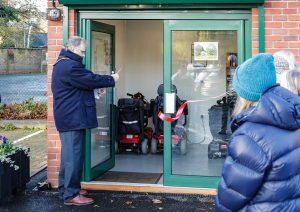 The wheelchairs can be folded for loading into a vehicle for home use, hospital appointments, visits to local events and places of interest. AccessAble are working with Buckingham Town Council to provide disabled access information to the area with access guides to 100 venues including shops, restaurants, hotels and parks. Follow the AccessAble link to go to the Buckingham AccessAble webpage.